Make small fritters and the mixture will hold together beautifully. 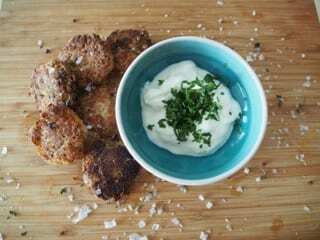 Great addition to a platter or try as a snack with minted yoghurt. One serving is 2 fritters. Heat 1 tbsp coconut oil in a pan. Add onion, garlic, and cauliflower and cook until softened. Add coconut cream and cook until mixture is creamy (you do want the cauliflower to have some texture but it should be soft). Remove from heat, pour mixture into a bowl, add, cheese, egg, salt and pepper and mix well. Refrigerate until cool. In a clean pan heat extra coconut oil. When oil is hot (mixture must sizzle when it hits the oil to ensure quick cooking and avoid fritters falling apart when turned). Toss large tsp's full of the mixture in almond meal and add to hot oil. Turn when they are browned on bottom and cook the other side until golden brown.